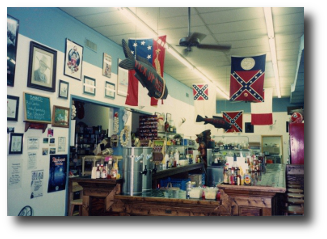 CBS Evening News sent Mark Strassmann to spend a day filming a segment on Senoia and the cameras were rolling in the Redneck! The segment was to complement the Oscars by running a story on how Senoia has become it’s own “Little Hollywood.” Check out the CBS story by clicking here. On November 9, 2011, Fox 5 Atlanta broadcast part of their Good Day Atlanta show from the Redneck Gourmet in downtown Newnan. Here are two of the live shots they did during breakfast. Also, check out their new Storm Chaser truck! “One of us is a redneck; the other is a gourmet. You figure out which is which,” says the burly, bearded man behind the bar, with nary a trace of tongue nor chaw planted firmly in cheek. 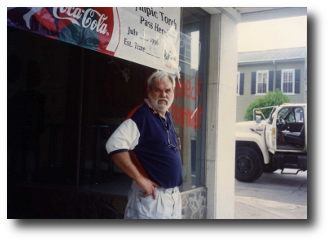 It’s late afternoon at the Redneck Gourmet, on the courthouse square in Newnan, and proprietor Mike Smith, whom both detractors and fans call the “Archie Bunker of Newnan,” is doing what he does best—holding forth. “In recent months, Newnan has seen corporate giants like Chili’s and T.G.I. Friday’s close their doors locally, and Smith said he’s heard fellow business owners complain that times are tough. Smith said he’s not impervious to the economic tumult, but there are factors that keep Redneck Gourmet swimming while other businesses tread water or drown. For one, the restaurant is no stranger to celebrity. 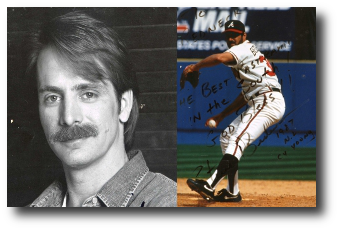 It has drawn the likes of country music star Alan Jackson, comedian Jeff Foxworthy, Atlanta Falcons linebacker Keith Brooking and former Atlanta Braves pitcher Steve Bedrosian.